Why would the Army’s most seriously wounded commander “The Most Wounded Commander in U.S. Military History.” want to become a member of the Benevolent and Protective Order of Elk? That’s what we asked Maj. D.j. Skelton – and here’s what he told us. The Skelton family has decided to live in Monterey CA after his retirement…”we’re here to stay.” D.j. is attending Naval Postgraduate School in Monterey, pursuing a Master’s in International Relations. The family includes wife Tucker Hirsch, who has just been admitted to a Master’s program at Berkeley, and their 3-year-old son, Dakota Keene Skelton. It’s been a painful military path to return to Monterey. D.j. underwent 86 surgeries and six years of rehab and recovery after service in Iraq, then returned to the Infantry, deploying again as a Commander to Afghanistan in 2011. He says the title of “The Most Wounded Commander in U.S. Military History” is a title he never wanted to earn. The new Elk grew up in Elk Point, SD (appropriately). He briefly attended the University of South Dakota before embarking upon an unorthodox path of serving our Nation over the past two decades. He enlisted in the United States Army in 1996 as an interrogator and is a graduate of the Defense Language Institute Foreign Language Center in Monterey. He attended the US Military Academy at West Point, and commissioned in 2003 as a 2nd Lieutenant. 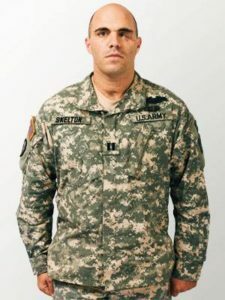 After graduating from the Infantry Officer Basic Course and the Airborne school, DJ was severely wounded while leading a rifle infantry platoon in close combat in Falluja, Iraq. “My face was pretty much gone. For the most part, there’s no reason I should have lived through that,” U.S. Army Major DJ Skelton said during an interview with Brittany Nielsen on KSBW-TV in December, 2015. Skelton had deployed to Iraq in November 2004 and fought in the Second Battle of Fallujah. His platoon’s first mission was simple: protect a critical overpass. “As a platoon leader, that was it. Go defend the overpass. That’s as simple as the mission was. By the time my platoon had gotten to that intersection, it was evening,” Skelton said. What he couldn’t see in the dark was that the enemy had dug in behind a nearby berm, and knew U.S. troops were coming. A car pulled up, two men got out, and the duo tried to blow up the overpass. Skelton gave the command to take out the threat. To do that, he and his men had to pass through an empty section of open desert. “We got attacked, and in that firefight, I got injured. I was the first to get hit. I actually made it to one of the cement pylons underneath the bridge at the location of the enemy. I got hit through a series of rounds from weapons, AK47 rounds,” Skelton said. A grenade hit the pylon he was leaning on, and a piece went through his leg. Shrapnel exploded through his upper jaw, through his mouth, and exited through his left eye. Besides the enemy bullet wounds he already suffered, his own ammunition began to fire from the heat of the grenade explosion. Thanks to swift thinking under heavy fire, his fellow soldiers got Skelton out of there. “They figured out a way to evacuate me under really heavy fire, which is really impressive, and got me to a support hospital,” Skelton said. Skelton then spent a month in a medically-induced coma at Walter Reed Medical National Military Center in Washington D.C. He woke up to his upper jaw destroyed, his left arm still attached but unusable, his knee down to his ankle now titanium, and he had traumatic brain injuries. He had so many bullet-hole wounds that doctors stopped counting them. He spent six months in the hospital. After his recovery at Walter Reed, D.j. 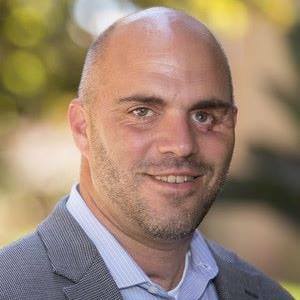 dedicated himself to advancing the causes of wounded vets, authoring “Our Hero Handbook,” a comprehensive guide to assist wounded service members and their families in their recovery and rehabilitation. D.j. also served as a military advisor Deputy Secretary of Defense, Gordon, England on veterans’ affairs and care for wounded service members. D.j. returned to Monterey CA in 2008 to command Echo Company of the 229 MI BN at Defense Language Institute Foreign Language Center. He also was the Associate Dean for DLI’s Middle East School. He returned to the Pentagon in 2010 to serve as a Special Assistant to Admiral Mike Mullen, the Chairman of the Joint Chiefs of Staff, advising on veteran transition issues, wounded warrior policy and improved services to military families. D.j. also served as a Non-Resident Military Fellow at the Center for New American Security, leading the “silent wounds” post-traumatic growth project for the Center. Skelton then became a catalyst for change. He forced the Army to decide what to do with a soldier who could not physically qualify to enter battle, but who still strongly wanted to serve. His advocacy spurred programs for other wounded warriors. “I just became one of the original wounded warriors of this generation that really challenged the way we looked at the human spirit, and what we could give back, and how we could contribute to the mission,” Skelton said. But serving as an advocate, even at the Pentagon, is not why he had joined the military. “I never joined the military to be a wounded warrior advocate. I joined the military to serve my country in a very specific manner. I wanted to serve in the infantry,” Skelton said. So, back he went to infantry training. Determined to keep a promise he’d made to his platoon on that fateful first deployment. D.j. completed the Infantry Captain’s Career course at Ft. Benning, GA, and was assigned to the 2nd Cavalry Comanche Troop, lst Squadron, 2nd CR in Panjway, Afghanistan. “I convinced myself I could go back to combat in a way I wouldn’t jeopardize soldiers around me,” Skelton said. In 2011, he joined his previous unit halfway through a year-long deployment to Afghanistan. He ended up leading a cavalry unit. D.j., fluent in Chinese, is one of the youngest graduates of Harvard’s Senior Executive Fellowship program and upon redeployment, D.j. was selected to serve as a China Foreign Area Officer (FAO). He completed Command and General Staff College and spent a year in Beijing, China, conducting in-region training as Foreign Area Officer. He also is the Co-Founder of Paradox Sports, a non-profit organization that provides inspiration, opportunities, and adaptive equipment to the disabled community, empowering their pursuit of a life of excellence and that gets wounded warriors back to their outdoor passions, like rock climbing. “I wanted to help other wounded warriors. Helping them get back to playing in the outdoors and things that defined their happiness — that completed their life. We work, but we also need to play,” Skelton explained. Monterey Elks Lodge #1285 says wELKome, Maj. Skelton, to the Benevolent and Protective Order of Elk. You’re our kind of guy! Maj. D.j. 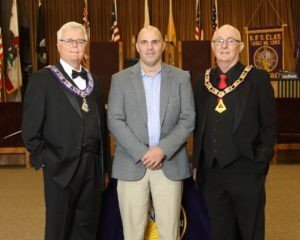 Skelton, the Army’s most seriously wounded commander, was initiated into Monterey Elks Lodge #1285 on Jan. 23, 2018 Skelton is flanked by Monterey PER Richard Ringler, right, and PDDGER Bud Hall, left. Filming in Monterey of the Golden Globe and Emmy-winning HBO series, BIG LITTLE LIES, recently brought a lot of excitement and a lot of charity cash to Monterey Elks Lodge #1285. Many weeks earlier, the Blue Blues Production location chief Sam Gomez contacted the newly-installed Elks ER, Beau Finklang, and began detailed planning. Luckily, Beau is a PER who thoroughly knows the Lodge facilities and the Elk requirements – and Sam is experienced in making a location work well, for all involved. Beau immediately contacted the five Trustees, who gave their approval to sign the parking lot agreement. Beau negotiated the final signing of the agreement – and immediate check – for $5000 which is being split between ENF and Major Projects accounts. Many needy veterans, children and others will receive help from the funds. At noon Wednesday, film serving staff whisked hot trays of salmon, chicken, mashed potatoes, green beans, peas, baby corn, etc. 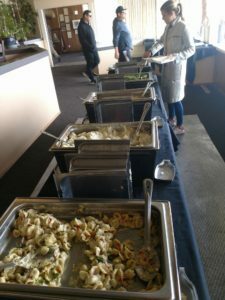 into chafing dishes set on tables they had set up in the Elks dining room earlier in the day, covered with black table cloths….and carried cold salads and desserts into 10 covered containers in another buffet line. A drink table held several choices. There was even ice cream! Then the crew got back into the numerous vans and left to film the crash scene on S kyline Drive. Every dining room table (and even the windowsills) was wiped down and the carpet was vacuumed. Each chair was placed back around the dining tables. 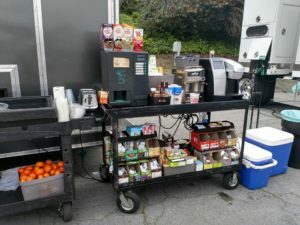 And every single staff member…technicians, cooks, trash crew, executives…had a smiling face and a kind word for each other. 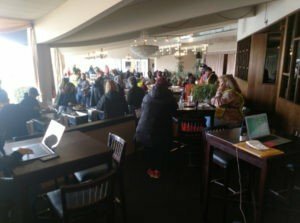 They even invited the Lodge office crew and bar patrons to fill plates before it was cleared away. What’s more, everything was left spotless. Plastic runners covered the dining room carpet along the buffet lines, and they were in and out of the dining room in little over an hour! They had numerous trash containers and emptied them frequently. So thanks to Sam Gomez, the Blue Blues Production location chief. It was a pleasure to work with you….come back any time! 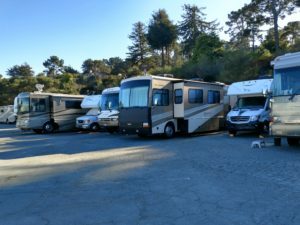 As most CHEA Elks know, Monterey has a fairly spacious RV-parking area. The film trucks used about a third of the lot, at the end nearest the Elks apartments. RV parking was not allowed only for the two days while the film crew was there. The crew marked off their area with red cones on Monday evening, ready for the big trucks and vans to arrive. 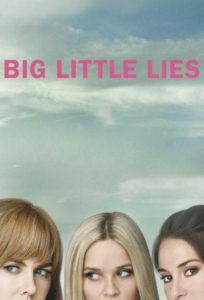 This is the second installment of Big Little Lies, based on Liane Moriarity’s bestselling book. The darkly comedic series tells the tale of three mothers whose seemingly perfect lives unravel to the point of murder. Original cast members Reese Witherspoon (Madeline MacKenzie), Nicole Kidman (Celeste Wright) are returning, along with Shailene Woodley (Jane Chapman), Laura Dern (Renata Klein), Zoë Kravitz (Bonnie Carlson), Adam Scott (Ed Mackenzie), James Tupper (Nathan Carlson), Gordon Klein (Jeffrey Nordling), Kathryn Newton (Abigail Carlson), Iain Armitage (Ziggy Chapman), Robin Weigert (Dr. Amanda Reisman), Merrin Dungey (Detective Adrienne Quinlan), and Sarah Sokolovic (Tori Bachman) are all set to reprise their roles. Meryl Streep has joined the cast as Celeste’s mother-in-law, Mary Louise Wright alongside other newbies, Bonnie’s mother Elizabeth (played by Crystal Fox) and second-grade teacher Michael Perkins (actor Mo McRae). Additionally, director Andrea Arnold (American Honey) will take over behind the camera. The drama will continue to explore the malignancy of lies, the durability of friendships, the fragility of marriage and, of course, the vicious ferocity of sound parenting. Multiple characters will be dealing with Perry’s death, and the prospect of moving past a life-altering event. In short: Things could get messy. There will be seven episodes. Season 1 writer David E. Kelley will be tackling each script, based on a story by best-selling author Liane Moriarty. Reese Witherspoon and Nicole Kidman will return as executive producers for the series — Kidman through Blossom Films and Witherspoon through Hello Sunshine — along with Arnold, Kelley, and Season 1 director Jean-Marc Vallée. Additional executive producers will be Per Saari, Bruna Papandrea, Nathan Ross and Gregg Fienberg. Members contribute generously of their time and money to numerous charitable events, helping with veterans, youth “Hoop Shoot” free- throw contests, scouting, scholarships, disaster relief, drug awareness and other programs. Our “Purple Pig” project provides in-home speech therapists, occupational therapists, vision and physical therapists to children who may not otherwise receive it. 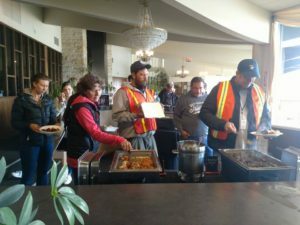 This is a reposting and UPDATE of an article that was shared in the CHEA Magazine so that your lodge can get more exposure for the good works you do each day. With changes in Google Search Engines, Facebook Algorithms and more, it is in our best interest to stay up with the times so you will notice a significant increase in word length for your Blog posts. Your lodge and your members do a lot to support the Elks charities as well as your community activities. Wouldn’t it be nice if more people knew just how hard you work? CHEA has this Blog, a Facebook Page, a YouTube Channel AND a Twitter account. It’s a high probability that your PR Chair and other members who love to share the benefits of Elkdom, are missing opportunities to get the word out! 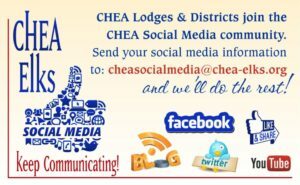 We have a coordinator for the CHEA Social Media channels that takes in submissions for the Blog and set them to post. From there the post is shared to our FaceBook page and beyond so that your success is amplified. Our social media inbox is empty. It could be because this resource is another of those “best kept secrets”. This is to help change that! Your volunteer hours and community support are best shared in the stories that inspire and encourage others to take action, to be filled with hope and increase awareness of all that the Benevolent and Protective Order of Elks does every day to make this world a better place. The magazine is limited by the physical space – the internet is not! While we try to use articles that are submitted to the magazine they have too little written content. Encourage your best storytellers to send pictures and stories in greater detail to cheasocialmedia@chea-elks.org and let’s make this the year that the best kept secret turned in to the most appreciated organization in your community! After meeting with Ray Lozano during Mid-Term we wanted to share these tips from him in an effort to help you keep your kids Drug Free. Mr. Lozano’s bio and contact information can be found at the end of the article. One fear parents have is that their child will cave in to peer pressure and engage in drug use. The broad availability of drugs will present a high cause for concern. There will include multiple theories concerning the ideal method of keeping your kids from the harms of drugs. A few parents think having stringent rules are going to be enough to scare their teenagers into avoiding drugs, yet unfortunately that might not be enough. There’s hope; multiple studies have proven that following these 3 steps is going to assist you in helping your teenager avoid the multitude of harms of drug misuse. Hiding your head in the sand won’t help you hold informed conversations with your teenager regarding drugs. You must educate yourself on all of the various kinds of drugs your child might be exposed to, as well as the effects they may have on somebody who’s using. If you’re educated on drugs you’ll have the ability to answer your teen’s questions with truthful and educated answers. Never make him/her feel bad if they ask a question. A few parents mistake questions for a confession of guilt. Jumping to these types of conclusions and accusing him/her prior to you hearing them out is going to decrease the chance that they’ll ever come to you with any questions again. As you’re learning of the various sorts of drugs your teen might be involved with you ought to study up upon the warning signs. Knowing about both emotional and physical changes which may arise as a consequence of drug misuse might aid you in detecting warning signs, as well as intervene prior to your child trying more harmful drugs or becoming addicted. Most teenagers are going to pull away from their mother or father because they have a desire to feel independent. Mothers and fathers oftentimes believe that providing their teenager space includes the only method of avoiding conflict. If you witness your child wanting to become more independent have a seat with them and discuss which kinds of responsibilities they might take on. Create a strategy with your teenager. Set up clear privileges, expectations, and consequences, in order for your teenager to feel in control. Such guided freedom is going to assist in giving your teenager the type of direction and self-confidence needed to avoid drugs. Activities also can play a major role in keeping a teenager away from drugs. Encourage him/her to become involved within art, sports, or additional activities. If your teen is already engaged in activities, you ought to keep up with their accomplishments and encourage them to remain focused. If you suspect drug misuse, it may be time for a well-planned drug intervention or expert assistance. Bottom line, talk with your kids, not at them. What’s the difference? When talking with your kids ask a LOT of questions. 8:30 Wake your son or daughter up. 9:15 Walk out to the car. 9:30 Pull into their favorite place to eat breakfast. 10:00 Ask a lot of questions in a non judgmental way. Since 1986, Ray Lozano has educated and entertained thousands of students in hundreds of middle schools and high schools from Alaska to Florida, and internationally in the Cayman Islands and Bermuda. Ray has a talent and gift for conveying what could be construed as boring drug and alcohol prevention information in such a fun and humorous way that his audiences come away informed and entertained. The best analogy would be giving your kids medicine in a spoon-full of sugar. There’s a good reason that Ray’s audiences feel like they just came back from the Improv rather than from a “lecture.” Ray has performed stand-up comedy at the Improv in Hollywood and Ontario, CA. It is his background in comedy that keeps his audiences coming back time and time again. The fact that he has been asked to return to many of the same schools across the nation, some for as long as 15 years, speaks to Ray’s ability to keep his information updated, fresh and relevant. Ray’s varied experience professionally has equipped him to become the unique speaker that he is today. His career started out in the Teen Challenge Ministry Institute, where he saw firsthand the ravages of drug use in young adults. Having not used drugs or alcohol, this was an eye-opening experience to see firsthand the deleterious effects that drugs have on a young person. He saw how drugs stripped away a person’s chance for an extraordinary life. 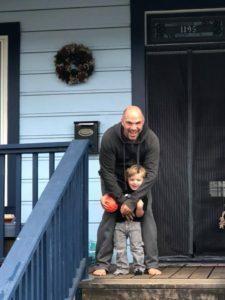 From working with people fighting their way back from addiction, he realized he wanted to work with kids before they got involved in drugs and alcohol, which led him to his work in prevention. As a Vice Principal for a private elementary school, he launched an after-school program with an emphasis on promoting a family-oriented, drug-free philosophy. This gave him an understanding from an educator’s perspective that schools are looking for the best for their students. Ray Lozano was the Program Specialist for a very successful youth prevention program at an internationally known hospital. The youth program provides drug and alcohol education for youth ages 14-18. Through the program, Ray increases the adolescent’s knowledge of the effects of drugs and alcohol on the body, the addictive process, consequences of risky behaviors, alternative choices and the ability to make positive life decisions. Ray holds a current certification as Prevention Specialist by the state of California as a drug and alcohol counselor. Greetings and Aloha to all California-Hawaii Elks Members. First Lady Ginger and I are hoping you had a pleasant holiday season and New Year’s celebration to close out 2017 and open 2018. Our travels to the Districts and Lodges, as we carried the message of our Elks programs, have been busy and exciting. Many of the Association Vice Presidents have accompanied us on our journeys throughout the various CHEA Districts. We also visited Lodges in Arizona and Nevada. So far, we have visited 14 Association Districts and 54 Lodges. Each Lodge we visited showed that the spirit of Elkdom is strong and vibrant. Our California-Hawaii Elks Lodges are following my slogan as they Reach Out and Share the Experience of the Elks in their Lodges and local communities. Many communities are benefiting from the Elks presence in their communities. The Lodges we visited are fully involved and committed to supporting the youth, veterans, our CHEMPI Piggy Bank and numerous local charitable programs in bringing the Elks message forward. The holidays are over, and we are in the last quarter of the Elks fraternal year. Now is the time to turn our attention to getting qualified members who will fill the Lodge officer positions. Each Lodge should reach out to experienced members who can fill important officer slots and provide leadership for the coming year. Our membership program continues to show gains which will provide another year of positive membership growth. I earnestly charge all lodges to concentrate on those members who are still on the lapsation lists. I encourage each Lodge to make one last effort to get those members to pay their dues and return to the active members list. Also, look at your candidates waiting to become members. Records show that many lodges have candidates who are close to becoming members. All that is necessary is to finish the Orientation and schedule their initiation. Your Membership Management Team should help get these members initiated. As we look forward to the coming months, plans are in place for the President’s Homecoming on February 23-24, 2018 and the CHEA Convention that will be held in San Diego on May 16-19, 2018. Mark your calendars and try to attend these events. In closing, let me remind all Lodge officers and members that it is easy for each to Reach Out and Share the Experience. A little effort on our part with a smile and outreached hand is all it takes. Kenneth LeRoy Moore, age 89 passed away on January 10, 2018 after a brief illness. Ken was born on a farm in South Dakota during the Great Depression. He resided in Corona, California for over 55 years, where he was a successful businessman who was also highly involved in the community. He was known as a quiet, honest and hard-working man who lead multiple organizations with dedication and integrity. He was selected as Corona’s “Citizen of the Year” in 1991. Ken was a loving family man who provided his wife and three children with a happy and comfortable life. He loved his family and was proud of his three children, 10 grandchildren and 12 great-grandchildren. Ken grew up in Huron, South Dakota as the only child of Edward and Emma Moore. He graduated from Huron High School at age 17, and then joined the Army Air Corps during World War II. He was stationed at Bowling Field in Washington DC, where he served as an air traffic controller. It was there in Washington DC that Ken met and married the love of his life, Rosemary Hurdle. After an honorable discharge from the Army Air Corps, Ken and Rosemary moved to Oregon, where he became an Oregon State Police Officer. Although he loved his work, it did not pay enough to support his family in the way he wanted, so he became a trailer salesman. He learned the trade well, eventually moving to Corona in 1961 to become President and Partner at GT Wolfe Mobile Homes. 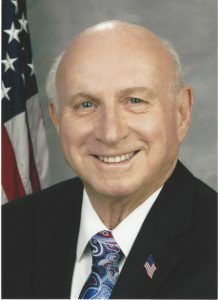 He was instrumental in forming Lancer Mobile Homes, Inc. in 1965, as Chairman of the Board and President, retiring after the sale of the company in 1973. 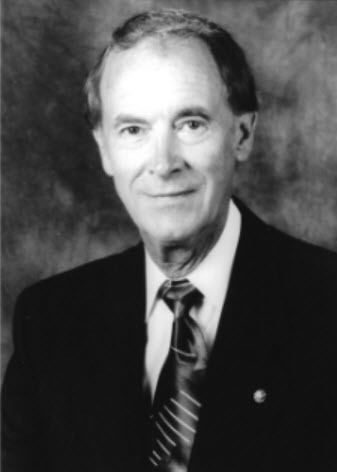 He then became a founder and Chairman of the Board of board of Corona-based Western Community Bank in 1980. Upon retirement, Ken spent his time as a recreational pilot, camping, fishing, boating and traveling with family and friends. He built his dream vacation home near Hailey, Idaho where he spent many memorable summers and winters with family and friends. He continued to be active in and lead numerous civic and nonprofit organizations in Corona. His greatest involvement was with the Elks Club, serving as the Exalted Ruler of BPOE Lodge 2045 (Corona) in 1968-69, California-Hawaii State President in1982-83 and Grand Exalted Ruler (national level) in 1994-95. Ken was a strong proponent of the charitable work done by the Elks. Ken is survived by his wife of 69 years, Rosemary, daughter Karen Stein (Bill), son Kenny “Skip” Moore (Cheryl) and daughter Karol Schmer (Ron), 10 grandchildren (Ryan, Cory, Melissa, Jennifer, Eric, Jason , Leslie, Michael, Monica and Megan)and 12 great grandchildren (Lucy, Cora, Matthew, Andrew, Mikey, Hayley, Madison, Allison, Calvin, Olivia, Owen and Wyatt). Family and friends are invited to attend a memorial service on Monday, January 22, 2018 at 11:00 am (Thomas Miller Mortuary, 1118 E. 6th Street, Corona ), followed by a reception at the Corona Elks Lodge #2045 (912 E. 6th Street, Corona). A private interment will be at Riverside National Cemetery on Wednesday, Jan 24, 2018. In lieu of flowers, the family requests that donations be given to the California-Hawaii Elks Major Project, the Corona Elks Lodge BPOE #2045 or the Loma Linda Veteran’s Administration Hospital. 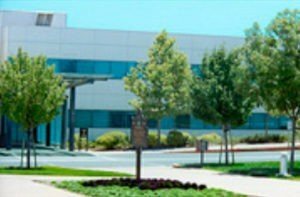 Ken’s family gratefully acknowledges the medical care, compassion and respect given to Ken by the medical staff of the Loma Linda Veteran’s Administration Hospital. October 1, 2017 marked the 1st year anniversary of a collaboration with the Martinez VA Hospital’s Hearts-at-Home program and the Walnut Creek Elks Lodge. On this anniversary day the Walnut Creek Elks Lodge served its 65th veteran by filling a previously homeless veteran’s new apartment with living room, dining room and bedroom furniture. 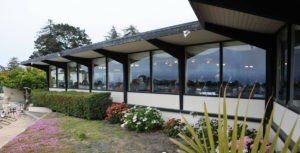 The Walnut Creek Elks started this program by giving six veterans boxes of dishware, flatware, glassware, pots & pans, new towels, cleaning supplies and assorted small appliances. Then a social worker with the VA asked, “Do you ever get furniture?” With that one question we expanded our program to include furniture. Through this collaboration and community support through social media (mainly Nextdoor and word of mouth) 65 veterans lives have been changed by giving them what most of us take for granted, a furnished home. This program serves veterans in both Contra Costa and Solano Counties. Elk members pick up donations, store them and deliver them to veterans. We thank the many communities that have supported us with donations. If you would like to donate to our program or would like to volunteer to help pick up and deliver furniture please call our Walnut Creek Elks Hearts-at-Home Program Chairperson, Denise Silva at (925) 787-2478 or e-mail her at denise_silva@comcast.net. As of November 5, 2017, 71 Veterans have been served. Greetings and Aloha to all California-Hawaii Elks Members. First Lady Ginger and I have started our travels to visit the Districts and Lodges as we carry the message of our Elks programs. Our first event took us to the Santa Maria Elks Rodeo. What a great community event sponsored by Santa Maria Elks Lodge #1538. It was a full four days of rodeo events shared with the Lodge members and the local community, including almost 6,000 third grade school kids and 40 plus military members from Vandenburg Air Force Base who handed out US Flags to the students as they entered the rodeo grounds. What a sight to see so many young students waving their flags and cheering for the cowboys and horses. After the rodeo, the next week we went to the Metropolitan District for the Luncheon Club meeting where I presented the programs for the year along with my slogan to encourage everyone to Reach Out – Share the Experience. We visited with members of the Burbank, Santa Clarita, San Fernando and Glendale Lodges during the weekend. The visit to Santa Clarita Lodge was highlighted by witnessing the annual Elks Flag Day Ritual. We also had a tour of the Entertainment Tonight studios and the Nethercutt Auto Collection. Our next trip took us to the West Central Coast District where we visited the San Luis Obispo, Lompoc, Santa Ynez Valley and the Oceano-Five Cities Elks Lodges. At Lompoc we were treated to a demonstration of the New Life K9 project which trains service dogs to help military members who need assistance. We toured the San Luis Obispo Tolosa Mission and the Solvang Classic Motorcycle museum. The next district on our itinerary was the Orange Coast District which included stops at the Buena Park, Westminster, Santa Ana, Mission Viejo, Garden Grove, Fullerton and Newport Harbor Lodges. The Santa Ana Lodge was a Luau celebrating their 115th Lodge birthday. We also squeezed in a tour of the Nixon library in Yorba Linda. My sincere thanks go to Rick and Debra Adams, Metropolitan District Vice President; Jay and Kristi Dupler, West Central Coast District Vice President and Scott and Mary Kay Stephens, Orange Coast District Vice President for the excellent job they all did in hosting Ginger and me during our visits. On all of our visits, we had a great time meeting Lodge Officers and Members and learning about their Elks programs and the great impact they are having on their local communities. I continue to express the importance of my slogan for this year to have all members Reach Out – Share the Experience. I ask all members to welcome their newly initiated members and invite them to join our committees and get the firsthand experience of becoming an active, involved Member of the Lodge. 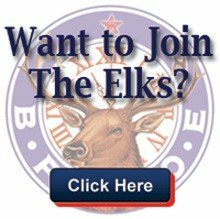 The goal of this message is for our membership to take the message of our Order into our local communities and Share the Experiences of what we as Elks can do to help them through the many times we interact with them. We can show by demonstration what we as Elks can do for their local community by allowing our local Lodges to become partners within their local charities for children and veterans. In closing, let me remind all Lodge officers to concentrate on reducing the number of members on the Lapsation lists. 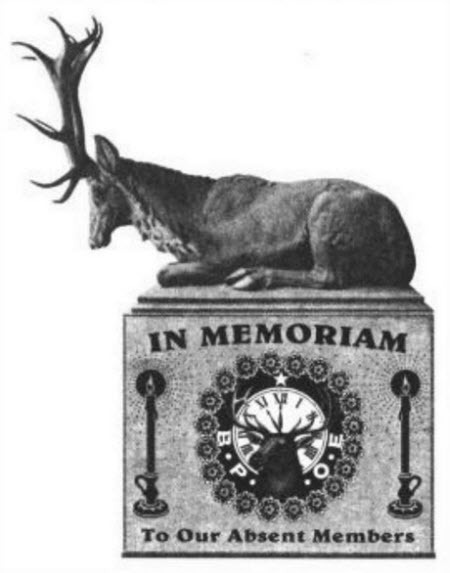 We are nearing the half-way point in our fraternal year and we all need to work diligently to retain those members so they can enjoy the full benefits of their Elks membership. We’d like to acknowledge the growing Facebook resources and encourage members to visit our FB page – the district resources are posted here. Spreading the word for ECD we are happy to pass along the following information. Once you’re there you’ll want to click ‘LIKE’ to stay informed about the Grand Lodge, State, District, and Lodges within our District well as outside our District. Viable topics include Lodges upcoming activities, featured past lodge activities, membership activities (how Lodges are driving increased membership), community activities, Scholarships, ENF, Elks Veterans, Statues & Annotates, Protocol, and Guidelines. Additional categories could be; Fun trivial quizzes about our Order, contests, conventions and so very much more including and importantly family-oriented Elk activities. Our site will save time by providing information that could be cumbersome to access, along with exchanging ideas that have been successful for Lodges in our District that others may benefit from without reinventing the wheel. Please consider utilizing this valuable asset that is owned by all Elk members. Please put a mention in your newsletters going forward every month to promote the site, place a spot in your daily routine for this Facebook site, a spot in each of your member’s memory bank about our site with honorable mentions at your Lodge meetings. Suggestions and comments are always welcomed. Congratulations to our participants and winners for CHEA Best Lodge Bulletin! Listed below you will find the overall winners and single or special event bulletin winners. To share the information you can download and print the PDF here.